Staying for vacation in a lighthouse is one of the most unique ways of spending your vacation. Especially in Croatia, where the lighthouses are one of the most beautiful. Isolated from the city noise, surrounded by wild nature and breathtaking sunsets, guests will feel reborn. Continue reading and take a look at all lighthouses we have in our offer. Other than being the oldest lighthouse in Croatia (built in 1818) it's one of the most accessible lighthouses on the Adriatic sea. It's 9 kilometers away from Umag. One can get easily to the lighthouse by car and can park it on a free parking space. There are 4 apartments in the lighthouse. There's a stone beach with a short shoal just 20 meters away from the lighthouse, while adventurers can enjoy windsurfing. Book an apartment in lighthouse Savudrija. In Istria there's also the Marlera lighthouse located on the same named peninsula 4 kilometers away from the town of Ližnjan. Known also as the Honey lighthouse because of a large number of beehives in the vicinity, there's a beautiful view from its top. It encompasses the magnificent Velebit mountain and Lošinj and Cres islands. This lighthouse is first choice for all of you who like luxury. Guests have at their disposal an outside kitchen with a barbeque, 1500 m2 garden, three bedrooms. One can also hire a driver and a chef for special occasions. Also, it's pet friendly and offers free parking. If you want to have a special and luxurious vacation, book accommodation in Marlera lighthouse. 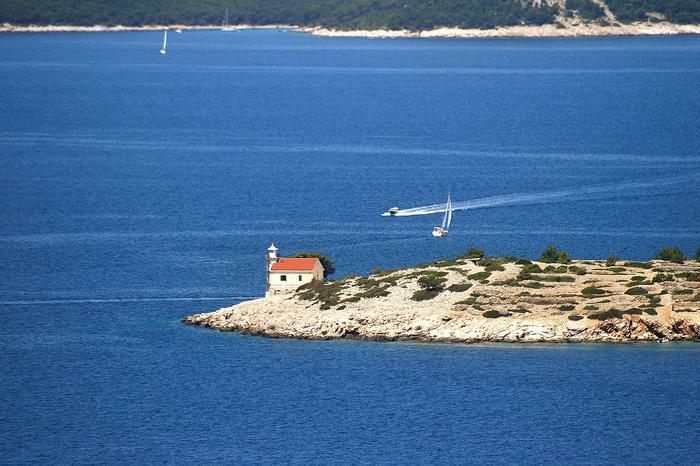 On the little rocky island of Sveti Ivan na pučini is located the Sveti Ivan (Saint John) lighthouse. It takes 20 minutes by boat from Rovinj to the lighthouse. The lighthouse consists of two apartments with 4 beds each. There's drinking water, hot and cold water supply, electricity network and GSM signal. There's a stone beach in the vicinity with a short shoal. But, because of strong currents we don't recommend to swim far away from the coast. Book an apartment in sveti Ivan lighthouse. Porer is another lighthouse located on a small, rocky island. Two kilometers away from Pula, Porer is part of the archipelago belonging to Rt Kamenjak – a protected nature park. It takes 15 minutes by boat from Premantura to the lighthouse. There are 2 apartments in the lighthouse, it has drinking water, electricity network and GSM signal. It's said that Porer is located between heaven and hell because of the extreme difference between the heavenly view from the top of the lighthouse on nice weather and strong storms and winds during the winter. Book an apartment in Porer lighthouse and enjoy the heavenly sights surrounding you. Make sure you visit the protected nature park Rt Kamenjak. You can get there from Premantura with car, a bike or by boat. If you're getting there by foot or with a bike, you'll get a free pass. Beside exploring the wild nature, the park offers some interesting manifestations, like the biking manifestation Full moon bike and kayak tour when you can ride your kayaks or bikes during nights of full moon. Take a peek into Kuća kulture (House of culture), the visitor centre in nearby Premantura where you can find out all you want to know about this rocky and wild part of Croatian nature, who once inhabited that area. Built in 1849, the Veli Rat lighthouse on Dugi Otok is one of the most popular lighthouses on the Adriatic sea. It's so popular that people book a few years in advance. Surrounded by luscious vegetation, a pebble and sandy beach, but also with a few settlements, Veli Rat is not as secluded as the other lighthouses in our offer. It's easily reachable by car or boat. It's connected with land by ferry line Zadar – Bribinj. From Bribinj, there's just 9 kilometers so you can get there by car. This lighthouse has two apartments, and there's a keeper who takes care of the lighthouse. To fans of diving we recommend visiting a nearby ship wreck. Book an apartment in Veli Rat lighthouse. Sv. Petar (Saint Peter) lighthouse is just 800 meters away from the centre of Makarska, a popular tourist destination, especially with families with children. There's an apartment with 4 beds and one extra bed. It has drinking water, electricity, and GSM signal, but it doesn't have a lighthouse keeper. This lighthouse is pet – friendly. Also, there's a rocky beach below the lighthouse. Book an apartment in Sveti Petar lighthouse. Pločica lighthouse is located on the same named island between Hvar and Korčula. Guests can get there by boat from Prigradica on Korčula. The lighthouse can accommodate a larger number of people because it consists of two apartments. First apartment is for 6 persons, while the second one can accommodate 8 persons. It has drinking water, electricity, and GSM signal. The island is ideal for bathing because of its shallow sea on the west side of the island. Rich with animal and plant sea life it's ideal for divers. Book an accommodation in Pločica lighthouse. This lighthouse is located on a deserted island 24 kilometers west from island Lastovo, but it's on a 100 m height so we don't recommend it to people with bad health. There are 2 apartments with 4 beds each. It has drinking water, electricity, and GSM signal, it also has a lighthouse keeper. Book accommodation in Sušac lighthouse. One of the farthest Croatian islands, Lastovo, also hides an impressive lighthouse. Surrounded with a hundred year old pine forest the Struga lighthouse still mesmerizes its visitors. It's located on the edge of a 70 meter high cliff. You can get there by ferry line Split – Ubli, and then drive by car to the lighthouse. It has drinking water, electricity, and GSM signal. There are 4 apartments in the ligthhouse. Guests have a secured parking space. We recommend Struga to persons in good shape and of good health. The sea surrounding the lighthouse is full of various fish species and large crabs. In the 19th century, a 18 kg crab was caught, and also the biggest coral in the Adriatic sea with over 45 kg. Book your apartment in the Struga ligthhouse. This is the farthest Croatian island, placed in the middle of the Adriatic sea. On a steep and picture perfect hill of 90 meters height one can find lighthouse Palaguža that has two apartments with 4 beds each. It has drinking water, electricity, and GSM signal. In the vicinity, there's a nice pebble beach with short shoal. It takes a long ride to get there. First, you drive with a ferry to Korčula for 3 and a half hours, then you get by car to Korčula town. From Korčula it takes 3 hours by a gliser to get to the lighthouse. So, this lighthouse is perfect for anyone who is brave enough to become a modern Robinson Crusoe. Book an apartment in Palagruža lighthouse.